Starting today, any YouTube user can request that captions be automatically added to a video, Google has announced. YouTube has had a feature for adding captions since 2008. Last year, it introduced a beta auto-captioning service — which converts audio to text — to a select group of users. That feature is now universally available. For now, auto-captioning is only available in English, and Google warns that it will only work for videos with clear audio and little background noise. 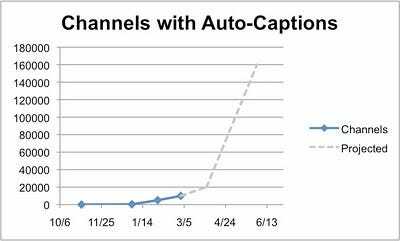 YouTube will create captions for all such videos over the coming months, and has provided users with the option of requesting auto-captions for particular videos to accelerate the process. Like all voice transcription software, auto-captions will be very fallible, and Google recommends that video owners check them over. But this will no doubt be a massive and immediate improvement for the hearing impaired.